Name Your Own Price You can pay anything you want, the amount displayed is only a suggested amount. Lets you combine two different layers into a single layer with a different front and back. You have the option to keep the 2 layers within the current composition, or have them placed into a precomposition. 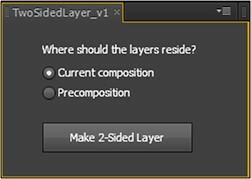 Both layers will stay as separate layers in the current composition. If you have a camera present in your scene, you can not parent it to another layer. You still have the ability to change the transparency of the front or the back layer like normal. The layers will simply switch between your new value and 0, depending on how it is rotated. A full suite of plugins to help improve everyday compositing workflows. Book preset for Cinema 4D (requires Mograph). Create your book with all the pages you need, adjust the size, the animation, rotate the base, flip through a page one at a time, and much more. Procedural and non-destructive way to slice your artwork in Adobe Illustrator. Buy it with the AE or C4D version for a 10% discount or all 3 for a 20% discount. Gridder arranges layers into a customizable grid in many ways - rectangle, 3d, circular or spiral. Non-destructive cleaning of inactive footage layers from your timelines. Smart copy and paste keyframes from multiple layers at the same time. Now with loop support. Easily create motion in various shapes (circles, rectangles, polygons, hearts, etc...) and animate their properties. Attach and align layers to single or multiple motion paths. Pretty cool actually!